Scooper - Technology News: Which countries have the best literacy and numeracy rates? Which countries have the best literacy and numeracy rates? 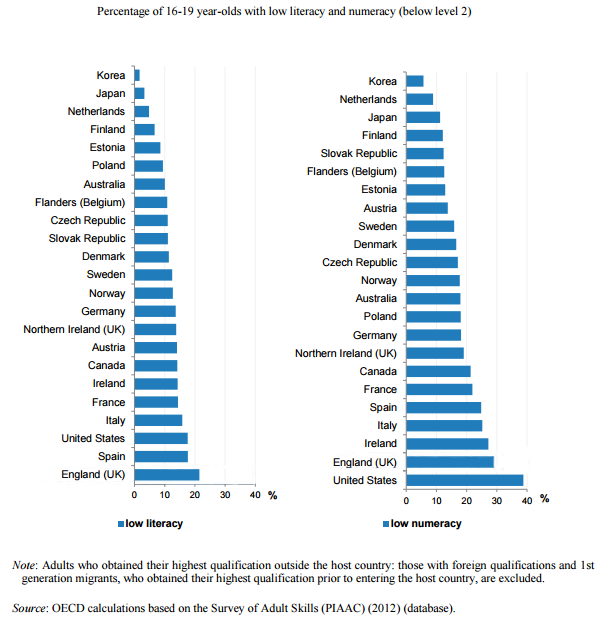 Teenagers in the Republic of Korea have the highest levels of literacy and numeracy of all OECD countries. The OECD looked at data from the Survey of Adult Skills (2012) and analysed the literacy and numeracy levels of 16-19 year olds. The Republic of Korea was found to have the lowest percentage of young adults with literacy and numeracy skills below level 2. South Korean education has seen remarkable growth over the past 50 years. The country is currently rated as one of the top performing in the OECD’s Programme for International Student Assessment (PISA). In 2012, 66% of 25-34 year olds had attained tertiary education, the highest share of any OECD country and a marked increase from 37% in 2000. Japan, the Netherlands and Finland also place highly with small percentages of young adults with low levels of literacy and numeracy. In comparison, England’s teenagers have the worst levels of literacy coming in last place with more than 1 in 5 having a low level of literacy. The country doesn’t fare much better in numeracy, coming second to last with more than a quarter of 16-19 year olds lacking basic numeracy skills. The United States is also low in the rankings, coming last on numeracy with almost 40% of 16-19 year olds below level 2. American teenagers have slightly better results in literacy with around 1 in 5 having low level skills.